The lack of a backlit keyboard on a laptop or notebook device is often a sign of cost-cutting, but cost-cutting is not something one expects on a premium product. That was unfortunately the case with the Chromebook Pro that Samsung launched last year, which offered attractive features such as a rotating touchscreen display and a built-in stylus but didn’t include a backlight for the keyboard. It was later discovered that Samsung was working on bringing a version of the Chromebook Pro with a backlit keyboard, and it looks like the company has quietly put up the newer version of the Chromebook Pro up for sale on its website. 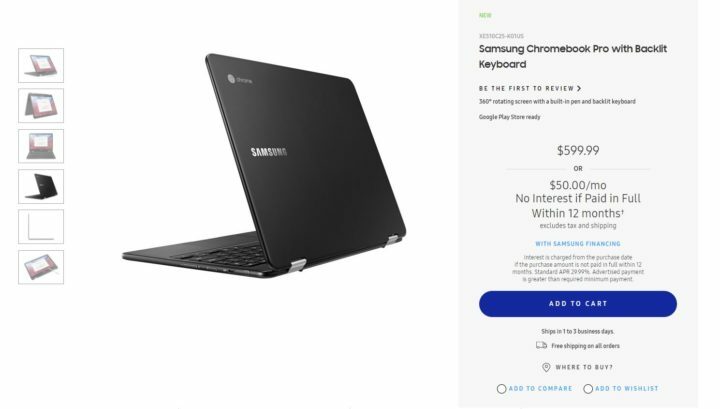 The new Chromebook Pro seems to be the same as the original version from last year except for the addition of a backlit keyboard, although Samsung is continuing to list the first version on its retail website, with both variants carrying the same price tag of $599. It looks like the company wants people who like fumbling for the keys on the keyboard in the dark an option as well, or it’s just waiting for stocks of the first version to be depleted before it kicks it out of the lineup, as a software option to disable the keyboard backlight is all one needs if they don’t like the keys lighting up. The specs of the Chromebook Pro include a 12.3-inch display with a resolution of 2400×1600 pixels and Gorilla Glass 3 protection, an Intel Core M3 processor that goes up to 2.2GHz, 4GB of RAM, 32GB eMMC storage, a 720p camera, two USB Type-C ports, and a 39 Wh battery. It has stereo speakers and, thanks to Google Play certification, can run Android apps from the Play Store.